A Fox News contributor fell out of his chair while taking a selfie with host Laura Ingraham on Friday night. Ingraham and the contributor, Raymond Arroyo, said it was all a joke. 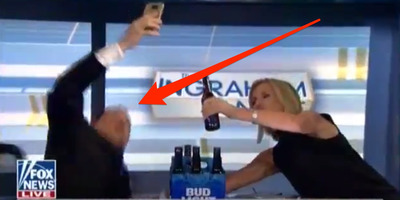 A Fox News contributor fell out of his chair while taking a selfie with host Laura Ingraham while the two held some beers on Friday night. The entire exchange happened on camera. During Ingraham’s show on Friday night, contributor Raymond Arroyo and Ingraham discussed several topics, including Judge Brett Kavanaugh’s pending confirmation to the Supreme Court, a Kavanaugh protest (which reportedly included cups of beer) near Sen. Majority Leader Mitch McConnell’s house, and people dying while trying to take selfies. “OK, before I go,” Arroyo said as he hoisted a pack of beers onto the table. “I thought just to bring it all together, Laura,” Arroyo said. “I like beer,” Ingraham said. “Go the edge,” Ingraham said, shortly before Arroyo fell out of his chair and off the set, out of the camera’s view. Following the incident, Ingraham and Arroyo said the segment was scripted.